Twenty-two years ago, ILM rocked the visual effects world with its photorealistic computer generated dinosaurs in Jurassic Park. That work was hot on the heels of groundbreaking ILM scenes in Terminator 2: Judgment Day, both films paving the way for the future of visual effects and filmmaking. Now, with Colin Trevorrow’s Jurassic World, ILM has returned to dinosaur action, looking once again to up the ante. fxguide talks to ILM visual effects supervisor Tim Alexander and animation supervisor Glen McIntosh about new approaches this time around, which included motion capture, on-set visualization and advanced flesh sims. We also speak with senior ILM visual effects supervisor Dennis Muren and visual effects consultant Phil Tippett, both pioneers on the original Jurassic Park, and who have returned to lend their considerable weight to Trevorrow’s film. A scene from Jurassic World. Revisit ILM's work on Jurassic Park with our interview with VFX art director (and vfx show host) TyRuben Ellingson, published for the film's 3D re-release. Watch a TV spot for the film. Also returning to the world of dinosaurs was Phil Tippett, who famously was set to take on the full motion creatures in Jurassic Park as stop motion (or go motion) animations before the power of computer graphics became evident. He remained on that show at the time as ‘Dinosaur Supervisor’ - delivering animatics and key insights into how the creatures should behave. See Phil Tippett and other returning crew in this featurette. Tippett also contributed some animatics and previs scenes for the raptors, and visited location as ‘a second set of eyes’, later making occasional visits to ILM to discuss animation with McIntosh and the team there. Tippett Studio also took on some marketing components of the film, creating toolkit ‘bumpers’ and working with Universal and Efexio to develop the Jurassic World Mobile MovieMaker app. Owen (Chris Pratt) with the raptors. Since 1992 there have, of course, been numerous innovations made in bringing CG creatures to life, from more realistic rendering to muscle simulations and compositing. One further innovation utilized on Jurassic World was employing motion capture for dinosaur movement, particularly for the Velociraptors. Owen rescues a work from the raptor enclosure. The final raptors were a collaboration between ILM and Image Engine, the latter studio incorporating an original ILM model into its pipeline. "ILM provided a near-final model of the raptor since there were also creating raptor scenes when the creatures appeared in scenes with other dinosaurs like the Indominus Rex, "outlines Image Engine visual effects supervisor Martyn Culpitt. "They gave us textures and models, and we made shaders and made sure our lookdev matched theirs. On this and on Turtles we switched over to full raytracing in 3Delight for rendering. It’s a very close tool to RenderMan which means we can work very closely to ILM, as all our AOVs and the way the stuff is broken out is very similar." Image Engine was able to use the mocap, too, in helping to drive animation beats. "It saved a lot of time in terms of the initial blocking out," says Image Engine animation supervisor Jeremy Mesana. "We’d go and animate on top of that with the locomotion required for the shot. In terms of re-targeting, we came up with a good system to what we imagined as being the raptor poses, in certain scenarios. It was more about hunching them over and bending their feet, and adding more of animal nuances into the character. At the end of the day it’s still just a bi-ped." 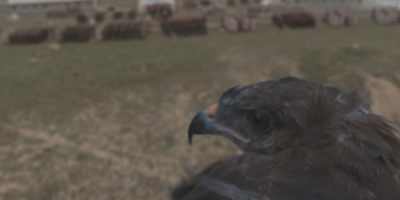 Image Engine would also deliver shots of the raptors engaged to hunt down the Indominus Rex (see below), the raptors chasing Claire (Bryce Dallas Howard) and the kids in a van, the lab sequence when Hoskins (Vincent D'Onofrio) is attacked, as well as an earlier extreme close-up shots of the raptor muzzles while they're held in containment. "The emotion in the raptors for that scenes was really being sold with the eye itself," says Mesana. "We couldn’t use the brows on the raptors - they were a rigid bone. All we were able to do was squint the eye and add very subtle pupil motion. That sold a lot of the life of the character." Owen rides with the Velociraptors. One of the film’s most exhilarating sequences features Owen’s ‘trained’ raptors heading out on the hunt for Indominus rex. Here, Owen and a crew weave through the jungle on motorbikes and other vehicles as the raptors race with them at high velocity. Practical photography and virtual cinematography techniques brought the sequence to life, again via an ILM and Image Engine collaboration. That knowledge informed the animators' approach to locomotion - mostly referencing an ostrich and tiger. “The ostrich,” notes McIntosh, “because it is not only the largest existing bird but it is the fastest two-legged animal on the planet. So the length of the steps and the cadence of the steps informed the animators. The tiger gave us the intense focus that predators have as they run where the body moves around the head but the head stays fixed and focused on its prey. The tiger also gave us the power of a predator that size charging and weaving through the jungle while on the hunt. Image Engine took some initial CG foliage created by ILM for a trailer shot and then delved into its own build via SpeedTree and other modeling. "We had a good place to work from since there was photography from Hawaii," says Image Engine's Culpitt. "We had close to 20,000 trees in some scenes with varying jungle and foliage. Most of it needed to be rigged so we could interact with the raptors running past, kicking up leaves and dust. We figured that you’d never be able to sim 8,000 leaves or plants, so we had to figure out ways to make it work. We’d have more canned versions of the trees or plants being hit to the left or right that we could then populate." Owen and an unfortunate worker try to escape the Indominus rex. The kids ride through the park. In the previous Jurassic films - as with many creature features - actors are required to perform without their reptilian co-stars on set. So they have to imagine them, a process often aided with a stick and a tennis ball, or a cardboard cut-out. On Jurassic World, these aides were still used - to great effect - but a more modern approach was also employed for both shooting and scouting dinosaur scenes. ILM discussed their scouting app - V-scout, recently at FMX. Here's our report from that conference on how ILM developed the app. The kids check out some of the park's dinosaurs. A further level of interaction was required for all the foliage the dinosaurs would be running and breaking through. “That’s one of the things that differentiates this film from the originals,” says Alexander. “They are really hitting everything and touching everything and breaking things down. In the forest we would chop away at a lot of the foliage, because we knew we would either have to be roto’ing it or replacing it in the end anyway. Image Engine delivered a 400+ frame shot of a herd of around 60 Gallimimus in the park, made up of 50 layers including moving grass clumps and blade, dirt chunks and dust, often referencing the 'flocking' shot from Jurassic Park. "We were always going back and staring at that little snippet from the first film," says Mesana. "It was always interesting trying to find the feeling of the Gallimimus. Trying to capture the same essence of that original shot was really tricky." The kids run from the Indominus rex. ILM has a big showing at SIGGRAPH this year in LA, including with Jurassic World presentations. There's a main production session, then other sessions that delve deeply into motion capture and geometric transfer solutions for the dinosaurs. All images and clips copyright © 2015 Universal Pictures.